Talk about perfect flakes! 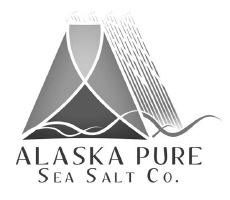 The Alaska Pure Sea Salt I sprinkled on my repast is made of countless little crystalline pyramids of sodium chloride that feel crunchy, but melt on your tongue and release a clean saltiness, quite different from ordinary table salt and quite delightful. 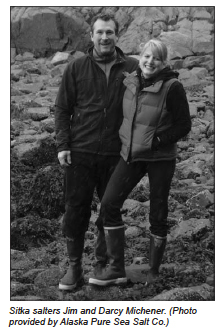 Jim and Darcy Michener of Sitka are the two entrepreneurs behind Alaska Pure Sea Salt Co. As with many great endeavors, serendipity played a role, one very much in line with Valentine’s Day. Jim, a charter captain and wilderness instructor, and Darcy, an optometry technician, met in Sitka in 1993 and got married six years later. They spent their honeymoon at a Forest Service cabin on Moser Island in Hoonah Sound – and they have returned to the cabin each year since. When you have to haul all your fresh water from town in jugs, you use seawater whenever you can, like for washing dishes. Darcy and Jim left a pot of seawater to warm on the hot woodstove and, as honeymooners may be forgiven for, forgot the pot was there. The seawater cooked off, leaving a healthy residue of salt. Making salt from seawater is not rocket science, but after talking with Jim and Darcy you begin to forget that. Jim explains that good finishing salts are meant to be used atop food already cooked, not to be used in cooking. The secret is the size and structure of the salt crystals, which is determined by scores of variables in the evaporation process. The best combination is determined by arduous trial-and-error and the resulting method is kept secret. “We experimented for years to get the perfect little pyramids,” said Darcy, showing me a photograph of a small pile of salt that looks like the purest snow. Indeed, she said, the process reminds her of snowflakes falling, as the pyramids rise to the surface of the brine and then slowly sink back down. Along with becoming a self-taught scientist, Jim has become something of a historian of salt. Both the word “salary” and the expression, “worth your salt” are believed to be derived from that salty Roman paycheck. The famed Roman roads were often built for an efficient route to the sea – and its salt. But the method of trapping seawater and letting the sun or fire evaporate the water to capture the salt predates even Rome. People since prehistoric times have collected seawater in beachside ponds and let the brine evaporate in the sun – and some still do so today. There are also artifacts of large pans made of a coarse ceramic material called briquetage used to hold brine over fires of wood or charcoal. Later, the pans were made of iron or lead. Jim explained that today most people’s table salt is mined from mineral deposits or from salty marshwater, where salt deposits naturally accrue. Those salts have been processed to have more uniform cube-shaped crystals, may be bleached and may have an anti-caking agent added to keep the salt from clogging up the shaker. Finishing salts such as Alaska Pure get a much more delicate treatment. Coming up with the right combination of ingredients, time and temperature – like brewmasters or vintners – took the Micheners years to perfect and they are very protective of their recipe. Needless to say, they’re as proud of their crystals as any customer of the Goldsmith Gallery or Baranof Jewelers. At Alaska Pure Sea Salt Co., the operation has grown steadily, if slowly, since the forgotten woodstove pot on Mosher Island. After years of experimenting for their own amusement, they began to develop their business in 2000. In 2007, they got their business license and formed the LLC last spring. With help from a low interest-loan from the City of Sitka’s economic development revolving fund, the Micheners were able to move into their SMC facility last fall. Previously, they were able to produce about 40 lbs. of salt per week. Now, they can produce 800 lbs. in the same time. Jim said most of Alaska Pure’s initial success has been the enthusiastic reception by a number of chefs. Gourmet and specialty salts began to gain favor in New York restaurants about 20 years ago and in Las Vegas spots for the last decade. Despite the growing market, there were no American commercial producers of flake finishing salt (North or South American!) before Jim and Darcy – Alaska Pure Sea Salt was the very first. Jim said that since then, two other West Coast companies have set up operations. “A trio of fine restaurants – or chefs, really – have been supportive of us since the beginning,” said Jim, naming three James Beard Award-winning Seattle-area chefs: Holly Smith at the Café Juanita, Johnathan Sundstrom at Lark, and Jason Wilson of Crush. How Jim and Darcy introduced Chef Wilson to their product is another case of favorable fortune in the Alaska Pure story. In 2007, Jim read an article in Food & Wine magazine about the best new chefs in America. Jason Wilson, one of the featured chefs, was pictured showing on his arm the distinctive tattoo of a fish. That summer, Jim was captaining a charter of four cruise ship passengers and he thought he recognized one of his guests. When the day got warm, the man took off his coat – revealing the distinctive fish tattoo. Jim told Chef Wilson he had a new food product and would bring him a sample in Seattle. When Jim and Darcy came to the restaurant that fall, Chef Wilson was gracious and welcoming, but his eyes lit up when he saw the sample was American-made flake finishing salt. Jim said the bulk of the company’s sales are to restaurants, which buy between 5 lb. and 20 lb. batches. 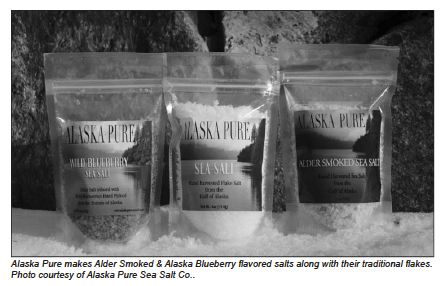 They are also selling to consumers through their website alaskapureseasalt.com and other specialty websites and stores. 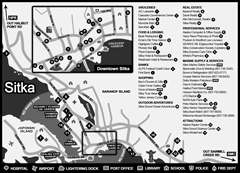 In Sitka, you may see Jim and Darcy selling their wares at holiday bazaars. 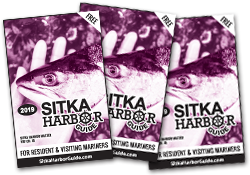 In Sitka, Alaska Pure Sea Salt is available at the Silver Basin kitchen store, the Sitka Sound Science Center and Murray Pacific. They’re branching out into flavored salts – like alder and blueberry flavors. In this case, the salt from our sea is flavored with alder and blueberries also gathered right here, from our local forest.